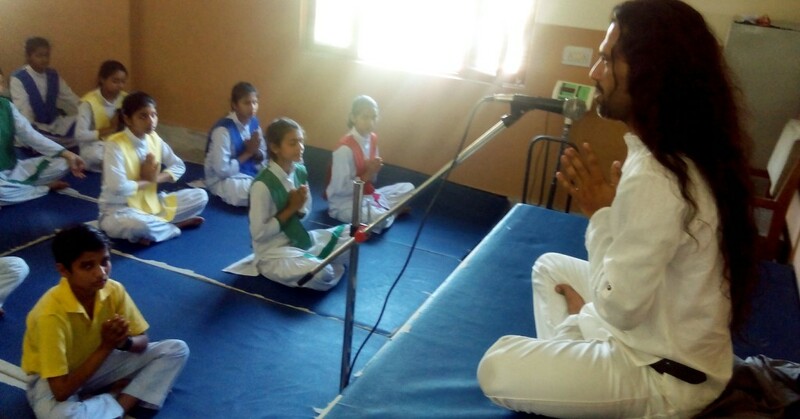 Should Schools, Collages & Institute’s In India Teach Kids How To Meditate? Can Mindfulness & Meditation Benefit School Childrens ? Mindfulness & Meditation Should Be Introduced To Primary School Teachers? We come to recognize there are many schools in India, which are low performing schools. It is not that these children are unable to read; it is that very frequently they are unable to sort information and to concentrate due to untrained minds and overstimulation. The correct usage of yoga and meditation can sharpen their intelligence, provide increased mental flexibility, creativity, increased focus, and increase the receptive capacity of their brain. A Vision of Shiva Girish, founder of the Satya Shivam Sundram for Yoga and Meditation & Stress reduction programs for modern india, We like to inaugurate the practice of Mindfulness & Active Meditation Programs For Schools, Collage Children s In India, Here we will instruct youngsters how to integrate academic resources and apply them to their utmost benefits through yoga and meditation. There are many creative ways of bringing meditation into your school. Shiva empowers educators with tools they can bring into the classroom, into the staff training’s, and with parents and volunteers, to make make mindfulness and meditation interesting and engaging for children. The school administration can employ this opportunity to invite and get in touch with parents to utilize in home life, to offer as public workshops for families, to teach the staff to integrate within the classroom, and as workshops to help staff grow so they can bring more to the classroom. The creation of great future of India rests on the shoulders of the school children and it is our responsibility to prepare them to be the best in the world. Mindfulness practice is a time-honored tradition that has been practiced by millions of practitioners for thousands of years, in the final few decades, there has been a developing body of research revealing, scientifically the benefits yoga and meditation. Research About Stress In School Collage Children In Modern Day. Kids today are certainly more stressed out than their parents likely realize. One in five kids said they worried a good deal or a great deal about things going on in their lives. It is a well-known fact that over 30 percent students admitted to such tension-related symptoms as difficulty in sleeping, as per the American Psychological Association’s annual study on stress in America. However, the same report observed in their study that just eight percent of parents were cognizant that their children experienced any stress at all. A study conducted at University of California, Los Angeles found 2nd and 3rd class students who practiced healthy meditation techniques for half an hour twice a week for eight weeks exhibited improved behavior and they even scored higher on tests involving memory, attention and focus than the non-meditators. Surveys held demonstrate that mindfulness in schools can fight burnout in teachers and reduce strain and increase happiness in students. Practicing mindfulness has also been related to increased brain activity in the areas associated with positive emotions. Meditation helps kids chill out, reduce impulsivity and act brilliantly.